As an adult, its easy to look back and remember all the things that I used to enjoy as a kid. And like many 80s born babes, I recall some pretty cool television shows that are still being shown today (or will soon be making a comeback). Rainbow Brite, My Little Pony, Care Bears, Power Rangers (oh, how I loved the White ranger...sigh...), Gummie Bears, Rescue Rangers, Pound Puppies, The Smurfs, and many more...and of course, Teenage Mutant Ninja Turtles. Yes, everyone adored those green turtles who lived in the sewers of New York City (getting their groove on with the Ninja Rap) with their father, Splinter. Who, also happened to be a giant rat. And every girl wished they could look like the voluptuous April O'Neil, in her yellow one piece body suit. Ha! Well, needless to say...the show has had many comebacks, movies, toys, and some pretty cool looking costumes. I was given the opportunity to work with Costume SuperCenter this year, and try out a costume of my choice...which just happened to be a Michelangelo costume for my youngest daughter. She loves Ninja Turtles, and we surprised her with this for her 4th birthday!!! The costume features a full length green jumpsuit with a molded chest to represent the underside of a turtle's shell. A brown belt goes around the waist so that the costume fits snugly, and brown elbow and knee pads give the turtles extra protection. A full face mask is included that's green and has an orange facemask painted on it. Priced at $27.96. I would highly recommend checking out Costume SuperCenter this Halloween, for all of your costume needs! Not only are they super fast at shipping, but they will save you money and time in finding the perfect disguise for you or your little ones to enjoy. As many of you know, I absolutely love to read to my children...we read from the moment we wake up, to the moment we go to bed each night. Ever since before they were even born, reading has been something we always did together. That is why I was so excited to participate in this summer's Love Books Summer Exchange. This program encouraged bloggers from around the world to exchange ONE children's book and a short educational activity related to the story. The girls and I received a book called Too Many Balloons written by Catherine Matthias, from Meeghan of Sight and Sound Reading. If you have a moment, take a few minutes to check out her awesome blog and discover new ways to teach your child to read. As a children's book enthusiast, I was surprised I had never heard of this book or the author. I pride myself on being an avid library patron, getting as many as 30 new books every week for my children to explore and learn from. 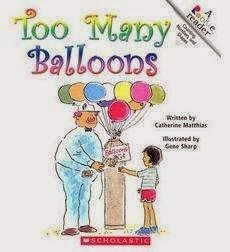 In Too Many Balloons, it tells the story of a young girl who shares her colorful balloon collection with the residents at the zoo. Not only does this book teach counting, numbers, shapes, and colors...it also teaches a little bit about animals, sharing, and even Science (how many balloons would it take to float?). One of my favorite parts of this book is actually the vocabulary word list, located at the end of the story. There are more than 30 words that I could use to challenge my 5 year old, who is currently learning how to read on her own. And if you ask my girls, their favorite part were the pictures (illustrations drawn by Gene Sharp). Each page displayed a colorful picture that brought the story to life, and a smile to my girls faces. For the activity, we were sent a packet of worksheets and had to put on round circle stickers (the ones used at a garage sale) to display how many balloons each animal had (see example above). Then at the very end, we created a HUGE balloon bundle and counted how many balloons the little girl from the story had in all. You will just have to read the book yourself to discover how many! We were also sent a wipe-off chart, which we used to practice writing vocabulary words and colors. Its never too early to start practicing those sight words for Kindergarten! We still haven't tested our Science experiment for how many balloons it would take to fly/float...but we may have an opportunity this upcoming weekend at a certain someone's 4th birthday. 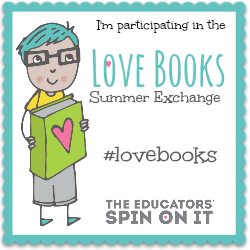 For those of you interested in learning more about the Love Books Summer Exchange Program, be sure to visit this website. You can see all of this year's participants, and find a ton of wonderful children's books + activities you won't want to miss out on. As we dive into our 25th day of January 2014...I just wanted to wish everyone a Happy New Year 2014! I don't update my blog as much these days, but thats to be expected with my girls growing up so fast and us trying to keep up. In the next couple weeks, I am going to be planning Destin's 5th Birthday. Its hard to believe that she is going to be 5 next month. We took the girls to see Disney's newest animated film, "Frozen"...and needless to say she absolutely LOVED it and switched her party plans (which were originally going to be Rapunzel). 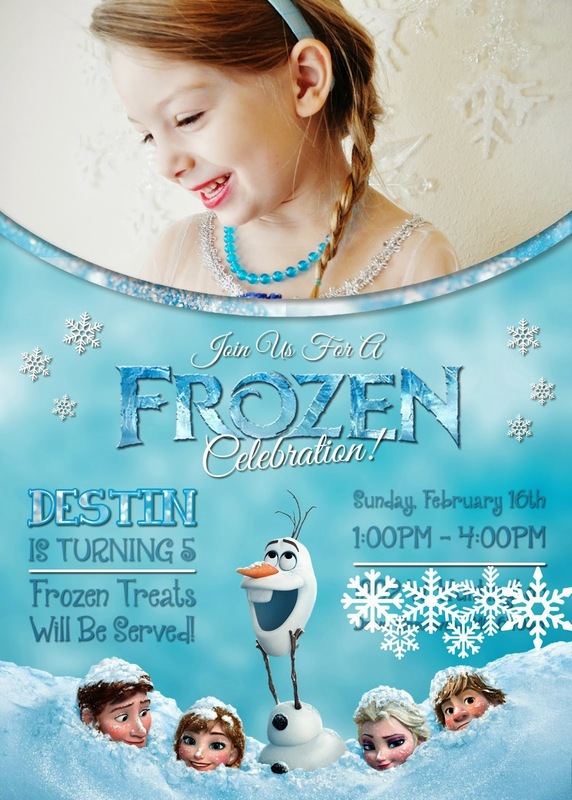 You can see my hundreds of Frozen Birthday Party Pins here via Pinterest. 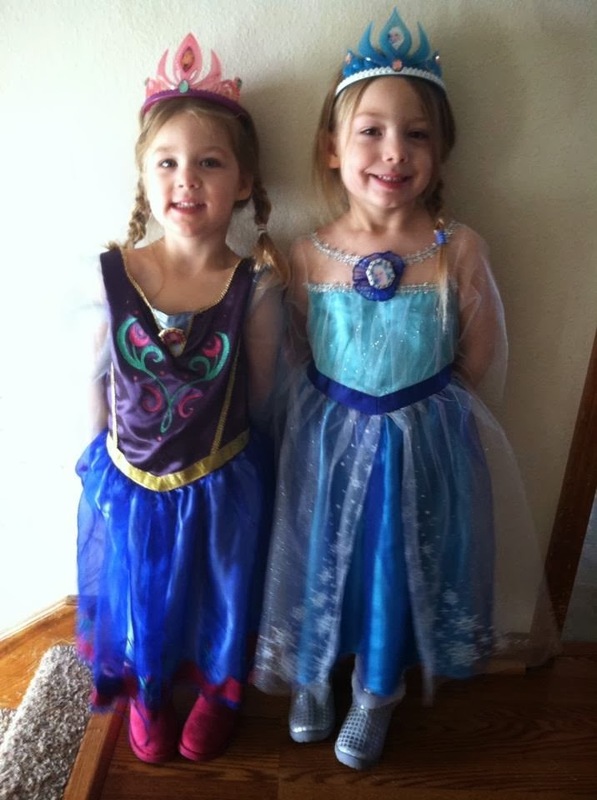 Since seeing the movie about 6 times now, both girls have played dress up with their Frozen dresses too many times to count. Destin is always Elsa and Arwen plays Anna. It is beyond cute! Besides her favorite new movie, Destin still loves Disney Princesses, playing dressup and really enjoys listening to mommy read chapter books every night before bedtime. She plans to play Tee Ball again this Spring/Summer. Arwen loves Lightning McQueen, Scooby Doo (still), Spider Man and Doc McStuffins. She loves playing with her princesses, blocks and also playing dress up with her sister. We signed her up to play soccer starting in March. Both girls are still really enjoying attending preschool. And I am still getting used to the idea of having time alone to myself. I am currently seeking a new prek program for Arwen next year at the moment. 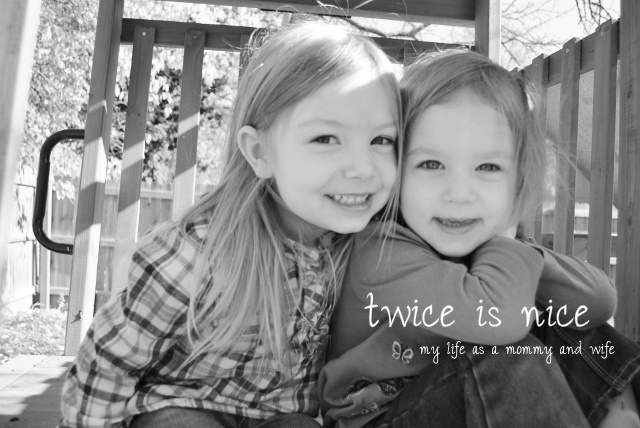 In less than 2 years, both girls will be in Elementary School and my plan is to go back to the working world. Its crazy to think that I haven't worked in nearly 5 years...not sure what to expect when I finally go back. Here are some of my favorite moments/pictures of the last couple of weeks...look for more soon! As a mommy of two little ones, it breaks my heart knowing that there will come a day when my girls won't want a story or a lullaby before bedtime. But until that day comes, I will continue to try as hard as I can to keep them little and cherish every moment I have with them. That is why I was excited to review this new product from Jammy Jams. In case you haven't heard of this group, they offer a fun, modern twist on lullabies for parents who strive to create memories with their little ones while teaching them a thing or two about their own style. Their music provides soothing sounds of vibraphone, marimba, xylophone, piano, blocks and more performed and arranged by Tim Phillips and Jeff Bradford. Jammy Jams features lullaby renditions of songs originally by everyone from Jay-Z to Whitesnake, Eminem to David Bowie, Lady Gaga to The Beastie Boys! And their latest creation, Greatest Naps, Vol. 2: The Best of Jammy Jams is quite a collection! Whether you are a classic hip-hop or alternative music fan or a connoisseur of rock, hair bands, or pop music, you and baby will enjoy this collection of lullaby renditions from a variety of musicians such as Daft Punk, Miley Cyrus, Fugees, Oasis, and Def Leppard. Expose your little one to multiple genres of music while effortlessly drifting off into dreamland. I really liked Whitney Houston's I will always love you. Not only was it soothing, but I did find myself singing the words out loud. Please note: Jammy Jams does not have any words, just the background music played in piano, xylophone and other instruments. If would like to learn more about Jammy Jams, I would encourage you to checkout their website, Facebook page, Twitter, Instagram, YouTube, and Pinterest accounts. You can also see a full list of Jammy Jams albums as well! And now for the Giveaway...if you would like to WIN a download of the Greatest Naps, Vol. 2 simply leave a comment below and tell me who you would listen/jam with. Good Luck!! The winner will be chosen January 2nd, 2014! 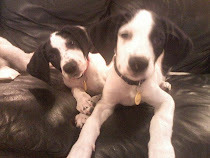 I really love to take pictures of the girls...especially when they are being sweet together, or just perhaps pose for mommy when I want. So here are a few of my favorite pics I have taken over the past month or so...Enjoy!